In this picture, I’m with my jet-lagged one year old, three year old and five year old. 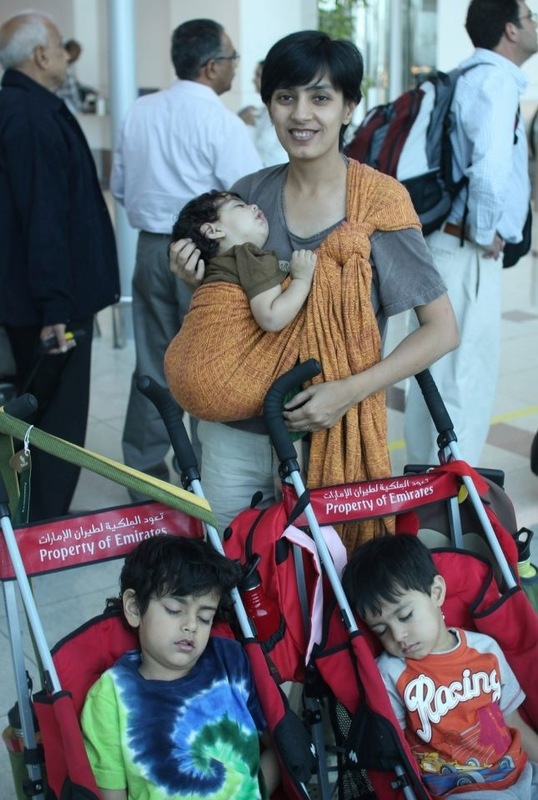 My husband took this picture at the Dubai airport, as we stood in the line to board our second flight, in the middle of a 22 hour journey from India to the U.S.
I’m wearing my littlest in a rebozo carry, in a 3 meter long woven wrap (Didymos Gold-Ruby Indio.) My older two are in strollers provided by Emirates airlines. Our layover was tiring but smooth, because the baby could stay, nurse and sleep close to mama and the bigger kids had a place to crash. My husband was prepared to wear our middle child and we could have woken up the oldest to walk with us, but it was much easier to let my husband lug the carry-on luggage and be able to give the two older ones the space to rest. (Major props to Emirates for providing complementary strollers that we then didn’t have to lug around outside the airport.) I am an avid babywearer and have wrapped my babies for the past five years. We don’t use strollers often, but this incident very clearly exemplified to me how wonderful they are too, and that neither method, experience and way of life has to be exclusive of the other. Babywearing throughout this crazy and hectic journey gave us convenience, safety, comfort and free hands 🙂 As we changed environments, time zones and a hundred other variables, it gave baby the one constant security of being close to mama and it gave mama the peace and freedom that comes with a content baby. I wear my baby(/ies) for the same general reasons, not to mention the fact that it has given me the gift of a wonderful community with encouraging friends and gentle teachers for many life-lessons. Love this! We’ll be traveling to India when Baby is about 8 months, and will be taking a similar route. Great to see you made it with 3 precious bundles. We like Dubai airport for layovers and have had good experience with Emirites, though this trip will be our first with a little one. Hope you have a great trip to the States and safe travels.